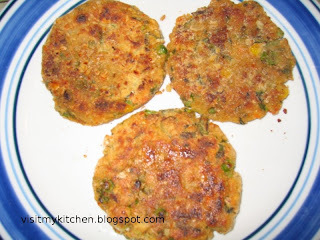 Visit my kitchen: Oats Cutlet - Who doesnt love cutlets? Same question who does not love it???? looking so good and crispy outside.. yummmy pass that plate..
Well, I guess everyone does...and why won't they if you made it sound so simple? Wow these are so healthy and delicious looking, i really wish i could grab one! Hi Sowmya,Cutlet looks yummy.Never tried with oats.I'm going to try this soon and Thank a lot for passing me the wonderful award. wow ... thanx for the recipe will try them asap ! must have tasted delicious ! Hi sowmya ... Super duper fastaaaa .. receipe solli mudikarthukulla ve i guess u would have gone to the kitchen .. anyway cutlet looks awesome .. keep rocking !!! !